November 30, 2017 – AlivePromo awarded government contract to help fight Zika. 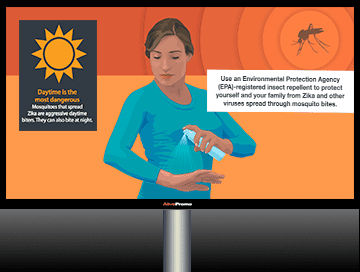 AlivePromo, Inc. in Minneapolis, Minnesota, a long time leading provider of digital display solutions for commercial properties and the government, has been awarded an important contract with the U.S. Center for Disease Control (CDC). The project includes deploying an alert signage system that will help communicate CDC messaging to visitors at ports of entry in the United States mainland and territories. Locations for the digital signage deployment include points of entry in Florida, Puerto Rico, the US Virgin Islands, Hawaii, and the islands of American Samoa. Deployment begins in early 2018 and will complete sometime mid year.